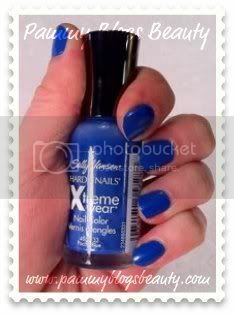 No, there isn't an actual Smurf painted on my nails (cute idea, right!). But this color sure does evoke images of the Smurfs!!! What a unique shade!!! Honestly, I don't even have another polish in my collection that is at all similar (and that is saying a lot considering how much nail polish I have!). I might not have picked this up on my own. But after seeing and hearing Allison @Amarixe recommendation, I felt that it was worth scoping out! In the fluorescent lights of the drugstore, I thought it was a periwinkle blue. But, upon getting it home, applying, and wearing it, it really appears to be more of a medium blue. A Smurf blue, if you will. What a fun color! The wear? I get about 2 days wear with this (a little shorter than average). But, I don't mind as I tend to switch my nail color after about 2-3 days anyway. Application: Fab! It is very opaque in just one coat. Finish: High shine cream finish with no shimmer nor sparkle. While this is a fun pop of color for the winter months, I know that I will be loving it even more come Spring/summer time! I think this would be beautiful paired with a white clothing. Flirty and fun for sure! For less than $5.00 per bottle, this is totally worth picking up! What colors are ya'll loving on your nails right now? Right now I'm testing out the new Revlon Colorstay nail polish that says it's supposed to last 10 days or something crazy... We will see when I do the dishes tonight! haha It is a fantastic pink though!